Come beneath Bistro LeRoux’s bright yellow and white striped awnings and experience one of the area’s most popular restaurants proudly presented to you from one of the region’s oldest families. Bistro LeRoux is chef-owned and operated by culinary team Jacob and Tiffany Guay, and is proud to offer a versatile fine dining cuisine at family prices. Enjoy Adirondack Cuisine – with menu selections ranging from a Rosemary Cabernet New York Strip Steak, to a Grand Marnier Grilled Salmon, Bistro LeRoux finds inspiration from the freshest seasonal local ingredients. It is excited to also offer vegetarian options such as Tofu Pad Thai to suit any palate, and half-plate and children’s menu options to fit any appetite. Combine the restaurant’s inspired menu with an incredible selection of fine wines, a full bar, mouth-watering dessert menu, and enchanting ambiance; and all that’s lacking is your company! Call for reservation and visit website for more information and a sample menu. 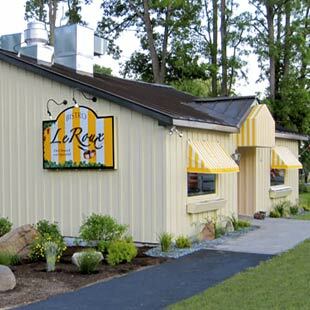 Bistro LeRoux is located on Route 149 at the corner of Bay Road in Lake George, just minutes from the Factory Outlets. Newsletter: Sign up to get the latest news on what's happening! © 2019 Lake George Guide, All Rights Reserved. Website by eVision Digital Marketing, LLC.